A woman sat alone at the table next to us on the sundeck overlooking the 18th green and the Pacific Ocean. She was waiting for someone who was golfing. She ordered prawns, a bottle of chardonnay, an artichoke, a cheese plate. She sent the waiter back for different cheeses, different crackers. “Yes, mam,” the waiter said. I couldn’t tell if he was asian or hispanic. She ordered another bottle of wine, a salad, a lobster tail. She adjusted the brim of her huge hat to keep the sun out of her eyes as she scanned the vast empty course for her companion. She ordered a gin and tonic , a piece of salmon and a ramekin of sorbet. She was about forty-five, thin, the victim of several cosmetic surgeries. She glanced around for her waiter, who had disappeared momentarily. She pulled the bottle of wine from the ice bucket and began to pour herself a glass, and the waiter reappeared, hurrying over to pour it for her. “I’m doing your job,” she said. “Yes mam,” the waiter said. 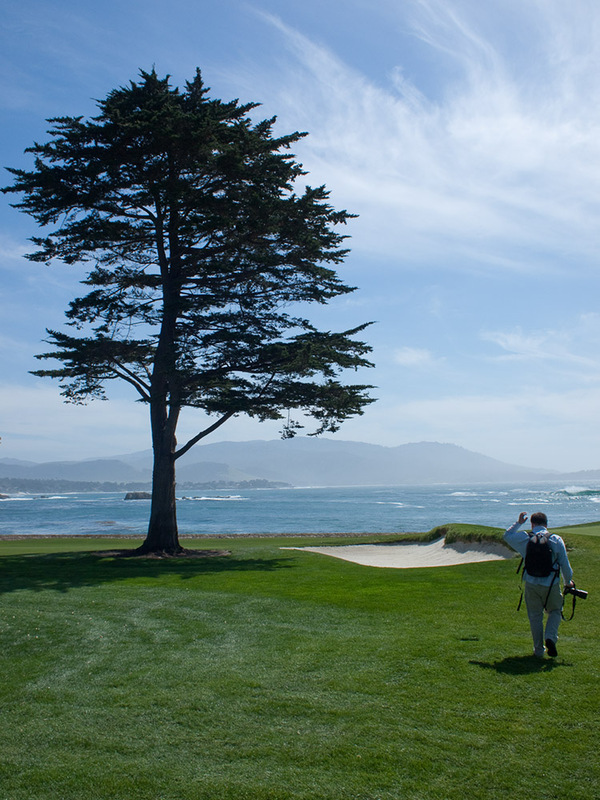 Me walking on the Pebble Beach golf course with my camera. This photo by Suzi. « unplanned Texas panhandle road trip honeymoon? Thanks, American Airlines.